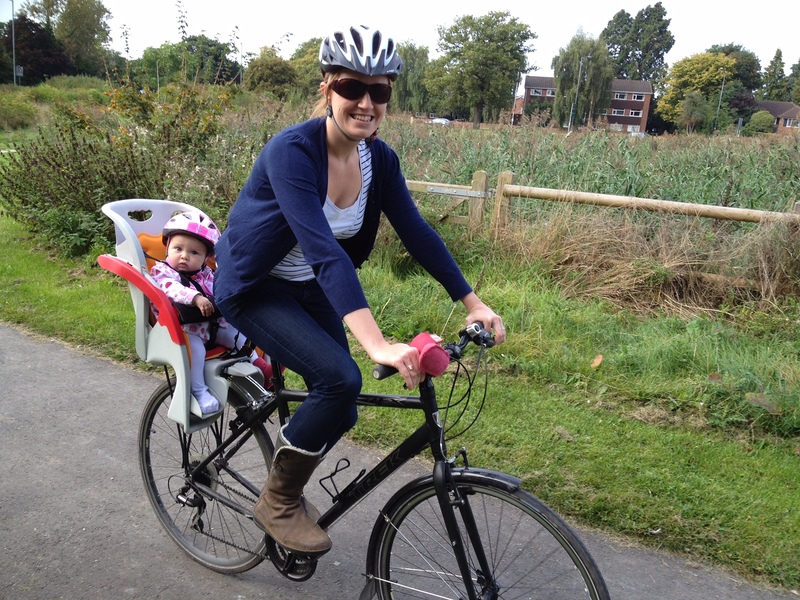 ADVENTURE | Pedal Faster Mummy! So let’s just get this out of the way first. We hit the tarmac. I’d like to say it wasn’t my fault, but I’d be lying. We were cycling along quite merrily, Emmy was chatting away on the back of my bike, Matty was in the bike seat on David’s. We passed a turning off the main trail and immediately began to doubt if we’d gone the right way. I braked without warning, thinking that David was also stopping, and he went straight into the back of me. Glancing the handlebars off Emmy’s head, David’s bike went over with Matty on board – thank goodness for helmets and a protective bike seat. Emmy barely noticed she’d been hit, Matty’s head didn’t touch the floor. Everyone was fine but it reminded us just how quickly things can change in a split second. And the importance of communication! When we lived in Copenhagen they held up their hand to signal that they were slowing down. We have whole heartedly adopted this approach now! Prior to that incident we’d had a lovely morning, rising early and packing up the tent, we armed the kids with a few fistfuls of dry cheerios each and headed off for Fremington Quay, a half hour ride away. Set on the disused railway line of the Tarka trail, opposite the River Taw, there is a fabulous family run cafe which serves up equally fabulous breakfasts. Sausage, bacon, beans, eggs – we all tucked in! They also have a great heritage centre exhibiting the industrial history of Fremington Quay’s past. The kids loved pulling the signal box levers, hearing the train noises and it was a great way of bringing it all to life for them. The Tarka trail is a stunning ride. It is one of the country’s longest continuous traffic-free walking and cycling paths and takes it name from the fictional Tarka the otter. We followed the Taw and Torridge rivers, pedalling alongside estuary mudflats, salt marshes and oak woodland. The ground is a combination of tarmac alongside the estuaries and smooth trail in the woodland. The disused railway path is lovely to ride on and we enjoyed seeing the old platforms as we pedalled along and tried to explain to Emmy that this was once a railway line. At a similar time we began telling stories. Emmy loves stories and as the weight allowance didn’t permit a book, we took to making them up ourselves. In fact, we got a bit carried away and ended up with a trilogy based around Rosie the Robin and Nasty Witch Freeze-a-lot. We’re unlikely to rival JK Rowling any time soon but it was a fun way to keep Emmy entertained as we bashed through the miles. Mid morning we mistimed one of Matty’s naps and he woke up hungry on the trail. Normally we would have just pulled to one side but the route had narrowed and we didn’t fancy trying to contain our one year old amongst stinging nettles and foxgloves. We decided to hang on for the signposted Puffing Billy Cafe, which promised hot coffee and an area to play. It didn’t disappoint. After the twentieth rendition of “Wheels on the Bus” and every animal on earth featuring in “Old MacDonald”, we managed to string Matty out to reach our destination and were so glad we had. It’s a fabulous cafe at the former Torrington railway station. The restored waiting room serves as a restaurant with toys for the kids, plus lots of picnic tables outside. Great coffee and they didn’t mind us eating our own food. We knew that our campsite for the evening had a swimming pool and were therefore keen to arrive while it was still relatively warm. Fuelled by lunch, Emmy decided it was time to prove to us how fast she could run. She set off along the raised footpath of the viaduct yelling at Daddy to pedal faster to catch her! It was just so lovely to have a completely traffic free route. We very quickly reached the turning for our campsite and set off down through the forested area towards our pitch. It was at that point we repeated our error from night one… to think we were home and dry! Quite the opposite. No hills this time but instead a ridiculously narrow bridge. Frustrating doesn’t come close! Emmy thought this was the perfect opportunity for Pooh sticks. We set about detaching the trailer. By removing a wheel we managed to rather precariously edge our way across the bridge with Matty staying asleep inside. Parent skills! We had a fabulous afternoon at the campsite. Pitching our tent right next to the pool in a sheltered garden, it didn’t take long for Emmy to pull on her wetsuit and jump in. She quickly made a friend and the two of them had lots of fun splashing around and sending David to retrieve the ball from the deep end. Having braved the perishing temperature (minus a wetsuit!) for over an hour, David eventually managed to coax Emmy out before they were both hypothermic! There was also a lovely adventure playground which kept both kids amused and had a nice balance of equipment to challenge both young and older children. Unfortunately what we hadn’t quite realised was the complete lack of food options nearby. The reception only opened for half an hour in the afternoon, and when it did we were given a takeaway phone number which had sadly finishing serving takeaway two years ago. Cue David setting off on a fish and chip bike mission and me trying to shower and put the kids to bed solo. We have debated for a while how we could have avoided this. I suppose the easiest option would have been to get a hot meal at the lunch stop, but you don’t really feel like this when you know you’ve got more riding to do. The other option is to take a small stove and backup meal but obviously it’s more weight to carry. We’re undecided. What we did discover is that a dinner of weetabix and cheerios did the kids no harm and they still slept soundly all night. For those who’d like to see the route overview and elevation profile see map below. I’d love to hear from anyone who has tried touring in the past to know how you do mealtimes? Perhaps we need to carry more ourselves. As always, any thoughts, comments, suggestions very welcome – we’d love to hear what you think! First day of our Devon coast to coast, the rain is drizzling but it won’t dampen our spirits, we can do this! Pull on the waterproof trousers, jumpers, jackets. Raring to go. Wave goodbye to the pretty seaside town of Ilfracombe and come face to face with the mother of all hills. Seriously. Who put bricks in the panniers? Emmy finds it hilarious. “Pedal faster mummy! Daddy is beating us, come on!” I push as hard as I can, stopping 100m from the top, and promptly take off the afore mentioned jumper and waterproof. Who am I kidding, surely it’s better to get wet than pass out from heat exhaustion. More than one flicker of doubt crosses my mind. What the hell are we doing? I am so unfit. I’d have struggled to get up this hill before having two kids let alone now…and then Emmy pipes up, “We’re going on an adventure aren’t we Mummy, this is incredible!” Incredible is a word she repeats a lot over the next few days, I start to wonder if she’s just trying to convince herself of this fact, but one glance at her expectant face and it’s enough to push on and claim those glorious views from the top. Matty, tucked up in the trailer, oblivious to the first hurdle having occurred less than 10mins into day one, is already fast asleep. The ride from Ilfracome to Woolacombe is beautiful. Coastal paths, fields for miles and although descending in a rain storm to Woolacombe beach was more than a little hair-raising, we took it gently and arrived to find the rain stopping and an amazing feast of pancakes in the little beach side cafe. Really relieved we’d brought the kids all in ones we headed to the beach, flying the kite and running along the wet sand. Children make it fun. They have this innate ability to live in the moment. There’s me thinking, wouldn’t it be nice if it was sunny, while Emmy and Matty are busy tearing around the wet sand, chasing the kite, loving life. Time to take a leaf out of their book. At this point it becomes quite clear to us that nothing is going to get Emmy off her bike. Not wind, not rain and certainly not tiredness! Like many toddlers she sees a daytime nap as the ultimate defeat. She’s back on board and we are just pulling off when David shouts for our attention. The trailer has a puncture. Ah. Everyone off the bikes again. A bonus of the trailer is that the wheels can be easily removed, so we were able to retreat with the wheel to the warmth of the pancake cafe. David set about mending the puncture and quickly discovered that a massive thorn had lodged itself into the tyre. A tip for all of you thinking of cycle touring with or without kids – bring a pair of tweezers. Thankfully our medical kit contained just that, and after bribing the kids with gingerbread biscuits so that we could dedicate two adult pairs of hands to the repair, we were able to pull out the thorn and David performed a textbook patch to get us back on the road. Our first play park stop of the trip was in the lovely town of Braunton. For those who are looking to do a similar route I thoroughly recommend Wild Thyme cafe – absolutely delicious lunch stop! Our other tip for anyone cycle touring is look out for library stops. It may sound bizarre, but when the weather is dodgy and you’re going through small towns, a library is actually a fantastic place to take a break. Cosy, warm and child friendly. We enjoyed a lovely hour in Barnstaple library children’s area, reading books and colouring pictures to give them a break from the weather. With an M&S picnic dinner purchased, we head for the campsite only 5 miles away. Just when we were sure that day one was in the bag, we round the corner to a 12% incline. If we thought the morning’s gradient was the mother of all hills, this was the grandfather. David bravely powered on, hauling the trailer and all it’s contents up, with Matty cheerfully riding in the bike seat. I had to admit defeat. For the first time Emmy and I climbed off the bike and started to push. I looked back at my little three year old daughter, pushing her bike up the hill, determined to do her bit, determined to be “just like you mummy” and I felt absolute wonder. Maybe it was the fresh air. Maybe it was us treating her like an adult. Maybe it was the sheer exhaustion that was making me totally emotional. But Emmy had undoubtedly loved today and that made it all worth it. While we pitched our tent and got the picnic stuff out, Emmy and Matty made friends with some fellow campers. Kicking a football, balancing on logs, playing with the resident dog and excitedly trading stories about the day. We’d ridden 36.5km and made it up 487m elevation. We all bundled into the tent, it certainly was a ‘squash and a squeeze’, but we were that tired that it didn’t matter. Where to begin? Our next adventure. We love cycling, the kids love cycling. We love camping, the kids love camping. We want an adventure, the kids think they do…. Is it possible to take a one year old and a three year old camping and cycling for several days? Let’s find out. It had to be an A to B route – I have an irrational hatred of retracing my steps! We chose the Devon coast to coast. 99miles Ilfracombe to Plymouth. It ticked a lot of boxes; beautiful scenery, disused railway lines converted to bike paths, lots of campsites to chose from. The downside? The hills. But how bad could it be? Slow and steady right? We’d be fine. We planned to cover the distance in five days, c.20miles a day. Three nights under canvas. One night in a camping pod. Cycling when Matty was due a nap. We quickly realised that Emmy was unlikely to sit still and be a passive passenger for several hours a day. It was time to break out the Follow-Me Tandem and get her cycling too. When she got tired she could either go in the bike seat or into the trailer. The unanswered question was how long would she be able to cope on her bike each day. This left the back of the trailer, two panniers and the remaining seat (either on the bike or in the trailer) to carry the tent, sleeping bags, camping mats and clothes. Time for some minimalism! For those interested, I’ll post our full packing list on a separate blog shortly with lessons learnt. For those looking for the highlights… A tent with two broken poles somewhat hinders your ability to sleep. If you all smell, your nose stops noticing. Convincing your three year old to take their smallest teddy remains one of the biggest challenges of the holiday. Snacks are mission critical. One of the challenges of a linear route is where to leave the car. We opted for an AirBnB in Exeter where we could park the car for the week and get the train the following morning. We were a bit nervous about getting all of our gear on the train (there are only 2 spaces which you can’t reserve in advance) so we deliberately opted for one after 9am and it was remarkably empty. There ended up being about 4 bikes on in the end but the guard didn’t seem to mind. The train goes as far as Barnstaple, 12miles south of Ilfracombe, but this was solved when we found a brilliant cycling shop in Barnstaple – Carb Cycles – who were willing to give us a lift. Mike met us at Barnstaple Station and through sheer wizardry managed to get us and all of our gear in the back of his van. Top bloke. This all had a big advantage of giving us a full day in Ilfracombe before beginning the tour. The kids loved Tunnels Beaches, a network of tunnels leading to a lovely sheltered beach and Victorian bathing pool. They paddled, went rock pooling and Emmy even had a go at body boarding. The perfect start to our holiday. We went to bed nervous but excited about what the first day of our adventure would bring. If you have any questions about how we planned for the trip I’m more than happy to share more detail of gear / logistics / route / etc. Watch this space for a round up of our daily escapades! Our daughter arrived in March 2014 and in that crazy rollercoaster of newborn baby emotions, our life most definitely changed. Up until this point my husband and I had spent a lot of time on our bikes. No super human challenges, just two people enjoying using bikes as our main way to get around. Living in Copenhagen for a year we’d experienced how cycling could be part of everyday life and coming back to the UK we’d tried to continue that. Braving the daily London commute by bike, trips to the shops, days out, all done on two wheels. But then our daughter arrived and cycling went out the window. Through the sleep deprived haze the thought of being able to get back on our bikes seemed a distant dream. And then the act of kindness. A neighbour walked over the road one Sunday morning and offered us his old bike seat and helmet for free. “The kids don’t use it anymore and I know you used to like cycling. Plus our kids just fell asleep as soon as we started riding”. We didn’t need to be told twice. With the promise of achieving a golden baby nap we put Emmy on the bike and tentatively set off for the first time as a family of three. Why hadn’t we done this before? Because getting out the house in itself is an achievement, imagine trying to do it on two wheels. Because you’re too busy trying to feed, sleep, stay alive that getting on a bike doesn’t enter you comprehension. Because you’re just too tired. But what did it achieve? Freedom once more! We found it utterly liberating. Suddenly we were able to get into town in less than half an hour, get exercise while Emmy napped, and the passion for biking came alive once more. Fast forward two years and our son was born. Again, back to square one on the bike front but this time we knew it was only a matter of time. And sure enough, once he turned nine months we popped him on the bike and we were off again. But now we have further logistics to consider. Two child seats gives no room for panniers to carry any luggage. The amount of stuff that two toddlers require is infinite, I reckon I could fill several suitcases given half the chance. I know i’m not a great writer, i’m not trying to be. What i’m hoping is that a few people can get a bit of inspiration to have a go at getting their family on a bike and fingers crossed, have a ton of fun along the way!